Survivors and witnesses of a plane crash in Nepal have described the chaotic moments when the aircraft went down, killing at least 49 people. 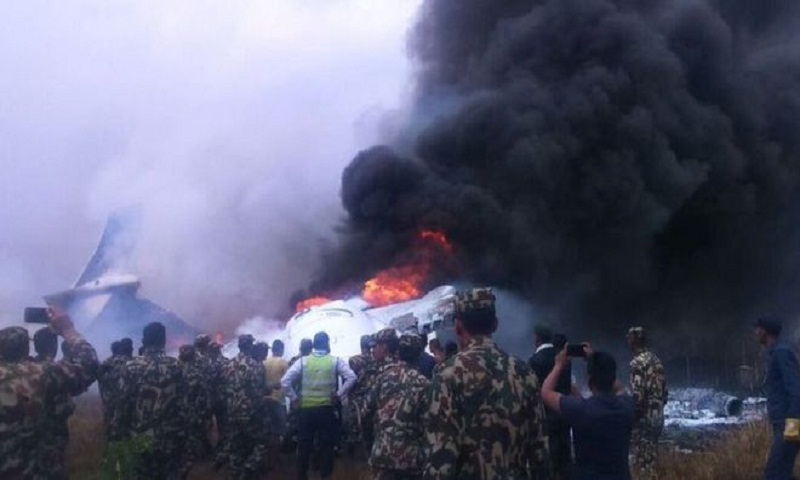 The flight, carrying 71 passengers and crew, crashed while landing at Kathmandu's Tribhuvan airport. Witnesses said there was a loud bang and that the plane shook violently while people wept inside the aircraft and chanted. The cause of the crash remains unclear, and an investigation is under way. The flight data recorder has been retrieved from the wreckage. It is the worst aviation disaster to hit Nepal in years. The Himalayan nation has a chequered history when it comes to air safety, with more than 70 crashes involving planes and helicopters since 1949, the year the first aircraft landed there. This aircraft was a 17-year-old Bombardier Dash 8 Q400 turboprop flying from the Bangladeshi capital Dhaka and was being operated by Bangladeshi airline US-Bangla. One survivor recalled the fire, but not how he made his way out of the aircraft. "After the crash I was trying to [get] out of the plane because it was on fire but I could not, my hand and leg was trapped," Keshav Pandey told BBC Nepali. "I was on the seat by the side of the emergency door, [so] maybe I fell outside when [security came] and they opened the door. After that I don't remember anything, I was unconscious." Another survivor also described the moment of impact to BBC Nepali. "There was a huge fire outside and smoke gushed into our cabin. Then there was [an] explosion. The fire was extinguished and we were rescued outside," Sharin Ahmed, a 29-year old teacher from Bangladesh said. "All of a sudden the plane shook violently and there was a loud bang," Basanta Bohora told reporters from his hospital bed. "I was seated near a window and was able to break out." "The plane was going up down, right and left, up down. So I thought that was some air traffic only," Sanam Shakya, who also escaped through a window, told AFP. Shradha Giri, who on board a plane on a nearby runway with her daughter, told the BBC: "There was a lot of chaos out there, lot of security personnel running towards it, a lot of ambulances and fire trucks approaching the site where it had crashed." "It was traumatising just to be with my little girl out there...everybody was shaken up because just something like that to happen in front of your eyes." The general manager of Tribhuvan airport, Raj Kumar Chhetri, also told BBC Nepali that relatives of the victims and survivors are set to arrive in Nepal on Tuesday. Of the 22 survivors, 11 are Nepali while 11 are Bangladeshi nationals. It is still not clear what caused the crash. While the airline blames air traffic control, the airport says the plane landed from the wrong direction. A recording of the conversation between the pilot and air traffic control minutes before the crash suggests some misunderstanding over which end of the sole runway the plane was cleared to land on. A retired Air Force Air commodore in Bangladesh, Iqbal Hossain, described to the BBC the challenges for pilots landing at Kathmandu. "There is a mountain right behind the end of the runway. "Every aircraft - while landing - has to maintain clearance from the mountain, and as soon as the pilot passes the mountain he has to do a very quick descent. "There is some plain land on the left side of the runway but on the right side there is a deep gorge, so if the plane skids off the runway then it will fall into the gorge. It is among the 10 most dangerous airports in the world." Monday's crash was the deadliest since a Pakistan International Airlines plane crashed in 1992, killing all 167 on board.